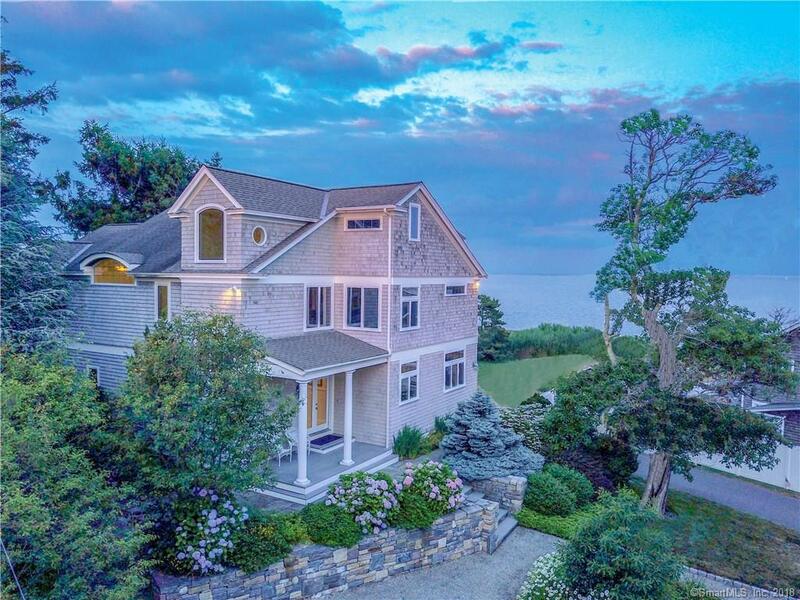 Rare, elevated, waterfront with commanding views of the Long Island Sound in the Guilford enclave of Sachem Head. Sunshine pours through french doors in this open and light, custom-designed home with an indoor/outdoor flow, filled with amenities and custom finishes. The chef's kitchen with top-of-the-line appliances opens to the dining, living room and a deck, popular with today's casual entertaining. The first-floor suite with private entry and full bath makes for a perfect in-law suite or Airbnb. Retreat to the enviable second- floor master suite with fireplace and LI sound views, sophisticated office, his & hers walk-in closets, bath with a walk-in steam shower, heated floors and jetted tub. Two bedrooms, full bath, laundry station with comfortable "she office" complete the second floor. The unfinished 3rd floor is plumbed for build-out. Comparatively low taxes & no flood insurance. Whether you are planting bulbs in the gardens, reveling in the scenery, relaxing on your private beach, swimming or sailing in the Sound, this home offers the best in waterfront living. Ideal for a car collector or a boat owner as the five-car, heated garage is outfitted with wash bay, French curtain drains and pitched floor. The Sachem's Head Yacht club is down the road and serves an active racing fleet and is a summer base for member families involved in sailing, swimming, and tennis. 75 minutes from NYC, close to Guilford's village green, train station, and a short drive to Yale., Four-season, professionally landscaped grounds. Elevation survey available. The waterfront lot is unbuildable as it holds two septic systems and is jointly owned and maintained by 616 Vineyard and three neighbors. Directions: From Town-Water St (Rt. 154) To Sachem Head Rd To Vineyard Point Rd Continue Straight On The Causeway To Number 616 On Left. If Doing Drive-By Take Left After Passing Home To Reveal Waterfront Setting Not Seen From The Road.